In the beginning, there was the original Ho Ho Gourmet Chinese restaurant on State Street in Salt Lake City, which begat a second Ho Ho Gourmet in Bountiful. Both are still in operation, as is New Ho Ho Gourmet on 3300 South in Salt Lake. Each restaurant is now independently owned and operated, although the menus overlap considerably. The focus of this review is the Ho Ho on State the first and, in my opinion, the best. I’ve been looking at online customer reviews for Ho Ho Gourmet and, not surprisingly, they run the gamut. Some people love the place; others hate it. A few are indifferent. As I say, I’m not surprised. Ho Ho Gourmet is not for everybody. If P.F. Chang’s is your thing, skip Ho Ho. Ditto if your favorite Chinese restaurant dishes are cream cheese-filled wontons and ham fried rice. You won’t be happy at Ho Ho. However, if you’ve ever set foot in a noisy, bustling, Chinatown restaurant, don’t care much about décor and lean toward dishes like claypot tofu or salt-crusted shrimp, then Ho Ho Gourmet is probably right up your alley. Many of the reviews I’ve read focus on the décor or, lack thereof and rightly so. You sort of want to eat at Ho Ho Gourmet with blinders on. There’s virtually nothing attractive about the dimly lit place and, should you need to head downstairs to the washrooms, things get even ickier. The door leading to the downstairs looks like it hasn’t been cleaned in years. But, if you have teenagers with bedrooms, you’ll be accustomed to this sort of grisly ambiance, and might be able to just look the other way. Try to focus on the food because it’s the food at Ho Ho Gourmet that makes the dismal décor worth tolerating. Well, that and the prices. Most dishes at Ho Ho which can easily feed four and come with loads of rice are in the $7.95 to $9.95 range. An order of six plump, pork-stuffed potstickers is a mere $4.25, as is an appetizer of char sil roasted pork. Spicy, authentic, and well-balanced hot-and-sour soup is only $1.25. But, here’s a word of advice: Unless you always default to kung pao chicken and sweet and sour pork, do yourself a favor and ask for the special Chinese menu. Servers don’t always give it to customers automatically. It has the good stuff, like a big plate of clams with a tart and tangy black bean sauce every one of the beautiful mollusks open and ready to be claimed, some three dozen or so of them. Ho Ho features a number of interesting seafood dishes, among them hot and spicy Szechuan-style shrimp ($9.50): large slices of zucchini, celery cut on the bias, julienned carrots, black cloud ear mushrooms, onion, water chestnuts, snow peas, bright red chilies and medium-sized shrimp bathed in a glistening, light brown sauce. This is a wonderful dish, as is the similar beef with garlic sauce ($8.50), which also incorporates scallions, green pepper and a smidgeon of red pepper flakes. Peking spare ribs ($8.95) were a happy surprise. I’d expected the chewy, fatty spare ribs with bones that you get in most Chinese eateries. These were boneless, lean and coated in an egg/cornstarch/flour batter and fried before being smothered in a reddish-brown, tangy and sweet sauce that was simply divine. And, speaking of divine, my favorite dish at Ho Ho is the rockfish, available whole or in bite-sized boneless chunks. I prefer the latter ridiculously light and tender morsels of rockfish served in a beautiful, light opaque sauce with onions that enhances, but doesn’t hide, the flavor of the delicate fish. Your kids don’t eat fish? Have ’em try this dish; they’ll devour it. Cantonese dishes dominate the Ho Ho Gourmet menu, and so I had to give the barbecued roast duck a go. You get a half duck, cut into bite-sized pieces, for $9.75. It’s a charcoal-roasted Long Island duck, glazed with a hoi-sen and honey sauce. Since meals at Ho Ho always provide lots of leftovers thank to generous portions, the duck makes for great tacos or duck salad the next day. Of course, dim sum is a staple in Canton, as it is at Ho Ho. While it’s not as extensive or varied as, say, dim sum on weekends at Red Maple, Ho Ho Gourmet has a decent dim sum menu available daily, upon request. 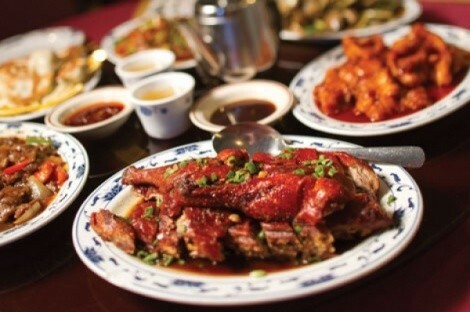 Popular dim sum options include ginger beef tripe, sticky rice in a lotus leaf, steamed spare ribs with black bean sauce, shrimp hargow, deep-fried taro, turnip cakes, steamed chicken feet with black bean sauce and a heavenly, artery-clogging egg tart. In those online reviews and comments I mentioned about Ho Ho, I’ve seen that a lot of non-Chinese customers feel like they received secondary service. I did not. The service during my visits was abrupt and matter-of-fact, yes, but not unfriendly and certainly not mean. Looking around at all the Chinese customers dining, I didn’t see them treated any more lovingly than we were. A couple of times, though, I’ve joked around with the manager of the restaurant and an older sidekick and they do have a surly sense of humor. Don’t be shy; make an effort to communicate and you’ll probably be surprised. However, if the ambiance and the service aren’t appealing to you, there are a couple of options. You could always head to Mandarin in Bountiful or maybe J. Wong’s, where the décor and service match the fabulous flavors. Or, you could place a takeout order at Ho Ho Gourmet and go next door to Piper Down for a cold one while the kitchen woks up your meal.